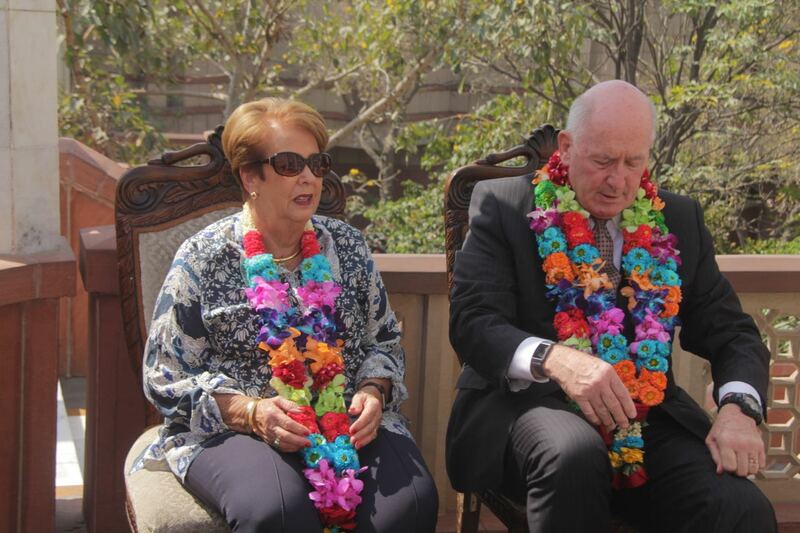 Peter Cosgrove: Governor General, Lieutennat General, Chief of Army, Commander, Royal Australian Regiment. 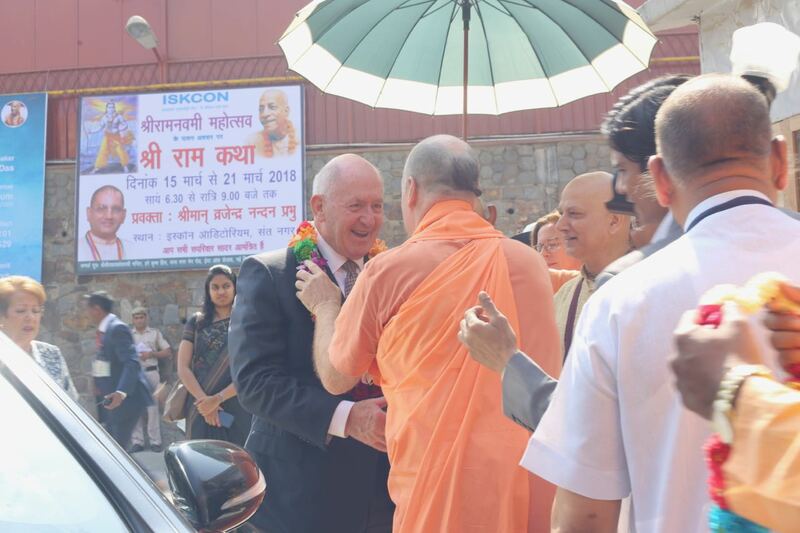 Due to the arrival of the Australian royalty in an entourage of 4 cars and a Mercedes limo, the main thorough fare (Rajadhirsen Marga) adjacent to Rādhā Parth-sarathi Mandir, was blocked off. 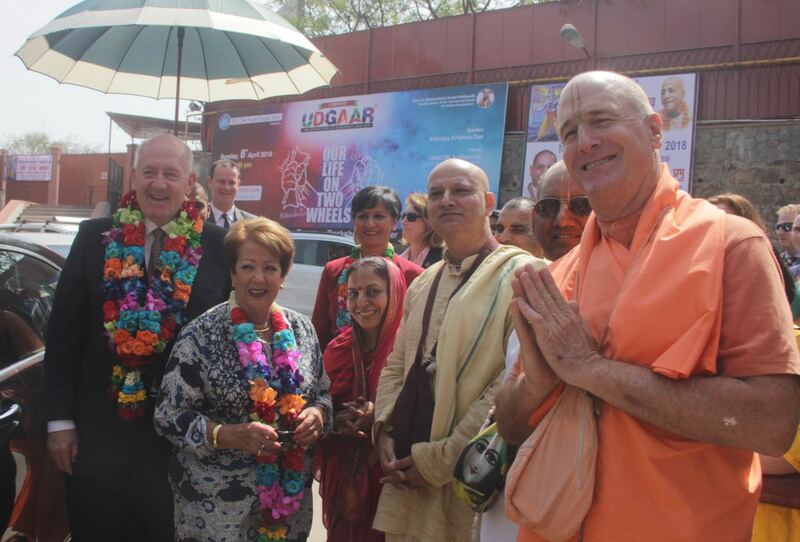 Sir Peter Cosgrove, along with his wife, Lady Cosgrove, was the first ever Governor General of Australia to visit an Iskcon center, accompanied by such dignitaries as Her excellency Ms. Harinder Kaur Sidhu, the Honorable High Commissioner of Australia to India and a team of nearly 15 Australian High Commission officials, guarded by security agents, wearing dark suits, sunglasses and communication earpieces. 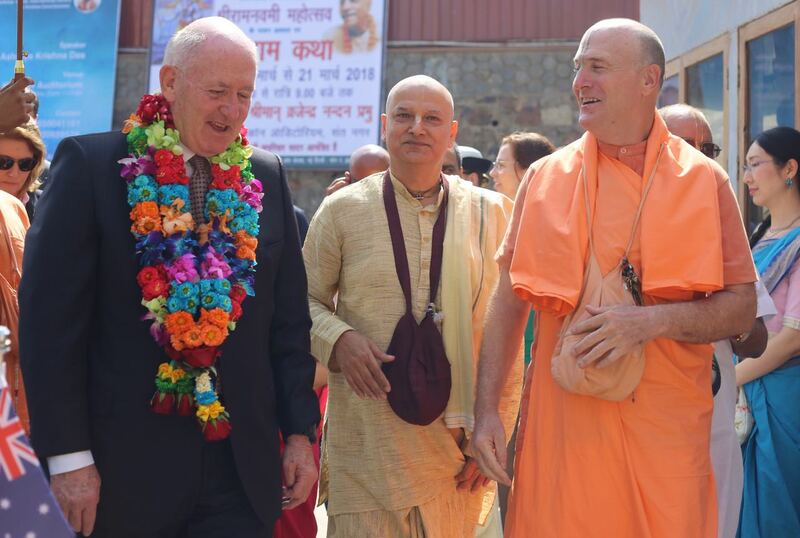 Also, 100 Indian security personnel and police officers were on hand. 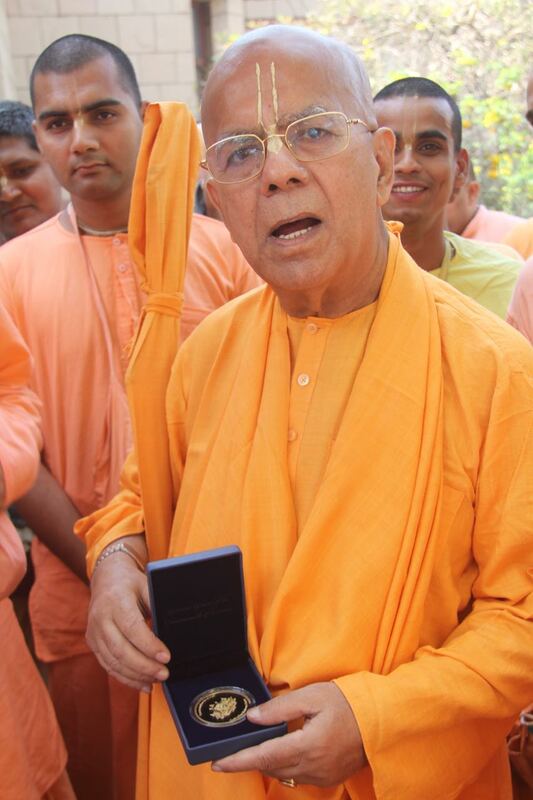 Representing Iskcon was a team of senior devotees: HH Gopal Krishna Goswami Maharaja, the governing body commissioner of Iskcon, HH. 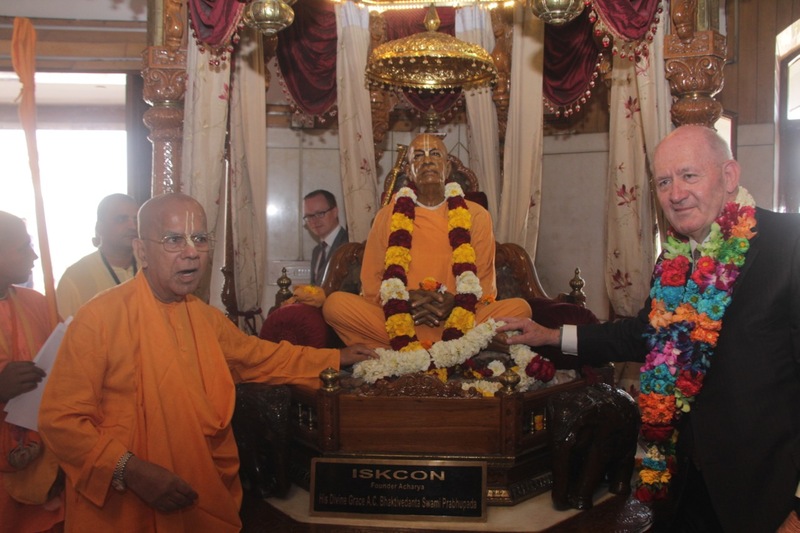 Bhaktisiddhanta Swami, resident sannyāsī, Śrī Vrajendranandan dāsa, the National Communication Director of Iskcon India, Ramanroop dāsa, Minister of Foreign affairs, Mohan Rupa, the President of Iskcon New Delhi, and Śrī Raghava Pandit dāsa, Vice-president. 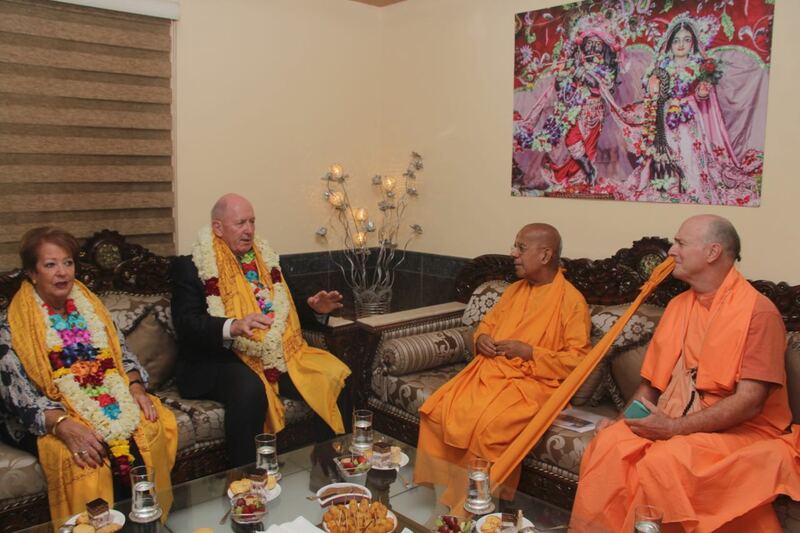 In this grand reception, colorful garlands were offered, with umbrellas to ward off the hot sun, surrounded by new recruit brahmacārīs (locally known as bumble bees), who led a joyful kirtan (His excellency quipped, ‘Who are those happy personalities in the hot sun?’) for the pleasure the newly arrived royalty, and supportive temple managerial brass. 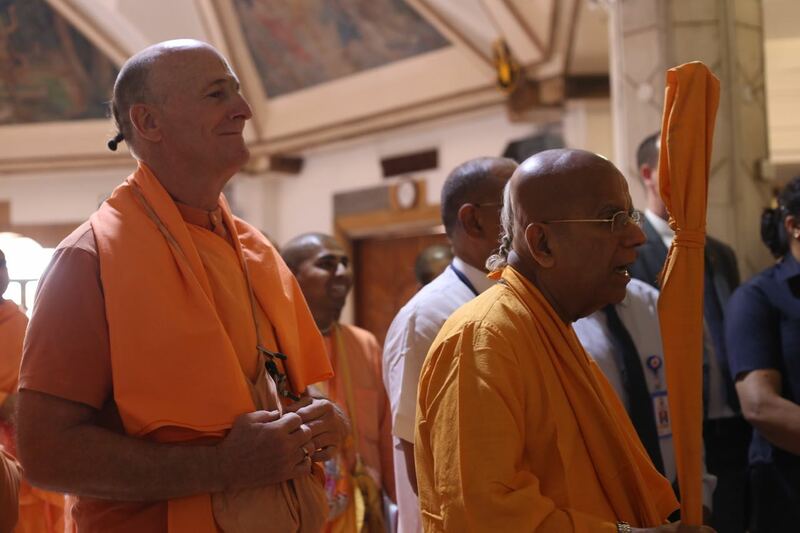 As we walked up to the temple, His Holiness Gopal Kṛṣṇa Goswami stood and met the Governor with another garland; now a complete welcome indeed. 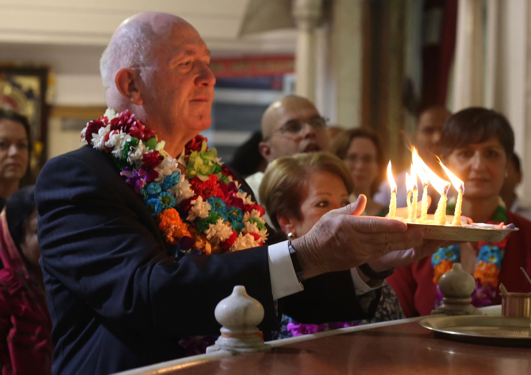 He was a very softhearted gentleman that carried a very authoritarian demeanor as a Governor, General, and Military commander. 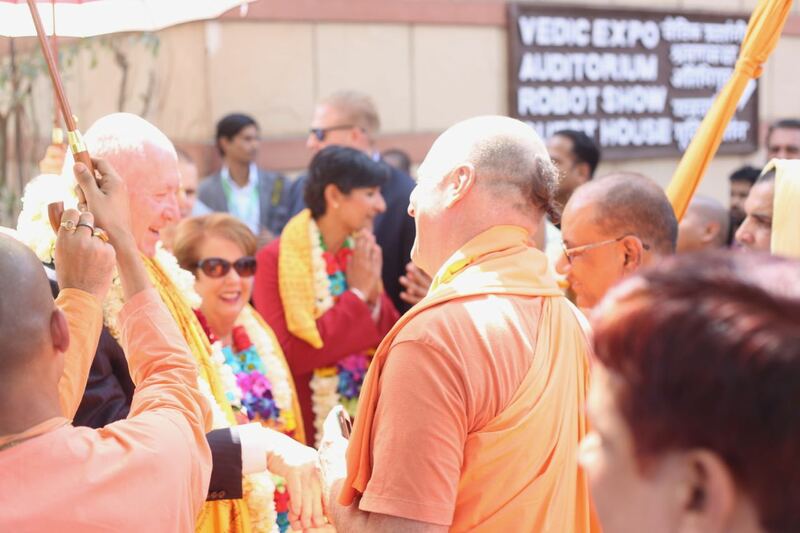 His wife, being very soft spoken, introduced herself and shook hands with all around. 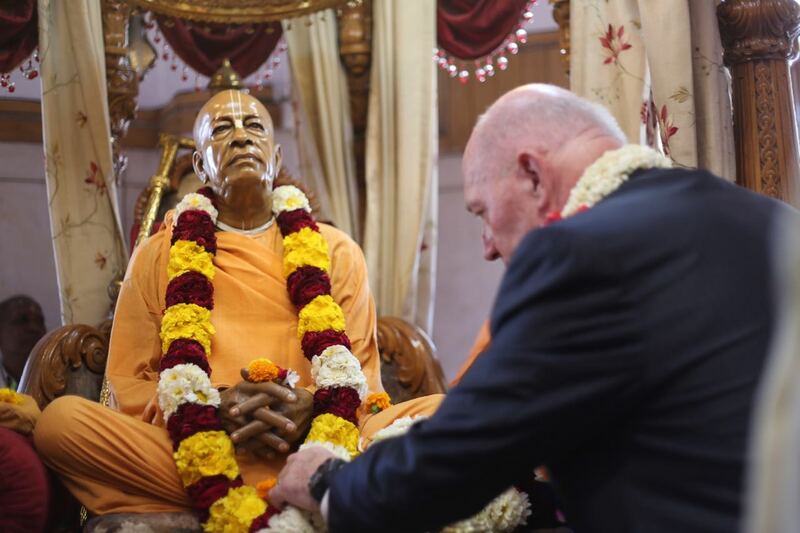 They both were seated, removed their shoes, washed hands, entered the temple, garlanded the murti of Srila Prabhupada, and posed with His Holiness for photos before His Divine Grace. 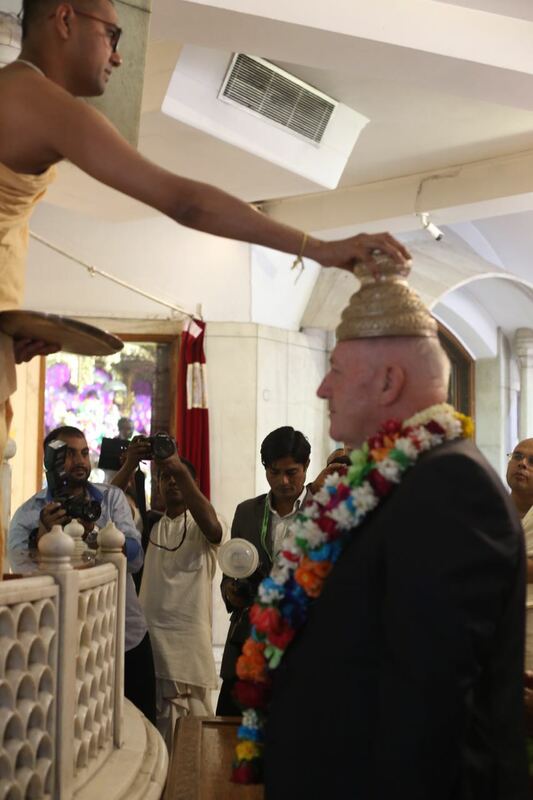 Then the couple went to the Gaura Nitai altar, received another garland, and satari (lotus feet) of the deities. 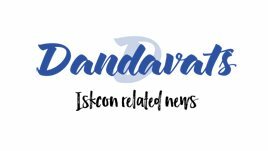 Next was the large deity of Nṛsiṁhadeva with Hiraṇyakaśipu, sporting a ripped stomach of scattered intestinal entrails (I was thinking, ‘Oh no what will be the Governor’s first impression be?!’). HH. 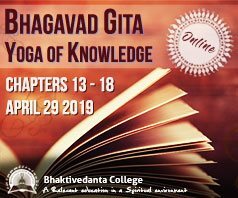 Gopal Kṛṣṇa explained simply, ‘That this was a form of the Supreme Personality of Godhead who has just killed a demon!’ Then his excellency replied (being a military man), ‘Well he certainly must have deserved it! A very impressive and comical response. 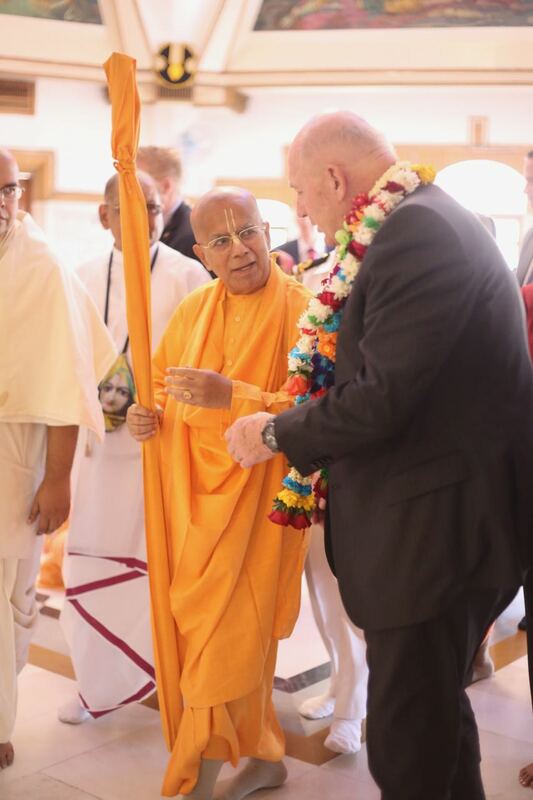 A secret service agent kept nudging me saying, ‘Please tell Guruji to move more quickly, all the while prodding us forward due to our slow pace and a tight schedule. 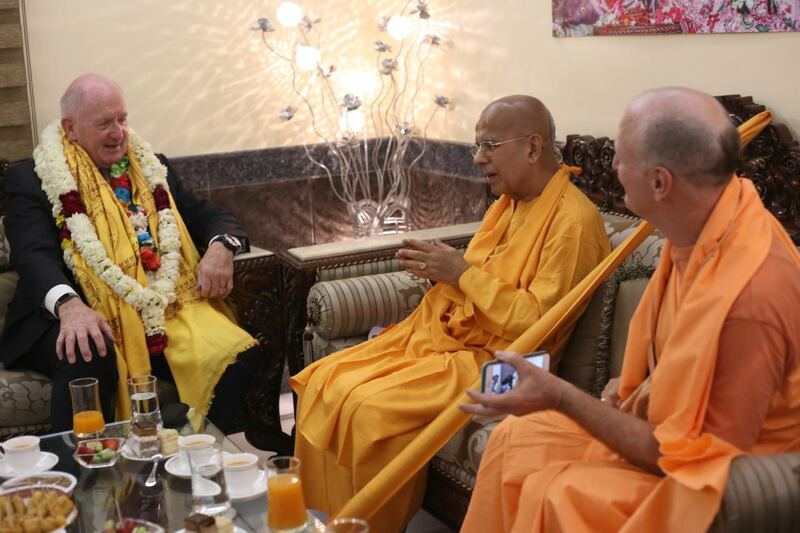 After relaying the message, His Holiness responded with a smirk said, ‘Ah not to worry.’ Yes, why disturb the most important event of this man’s life? 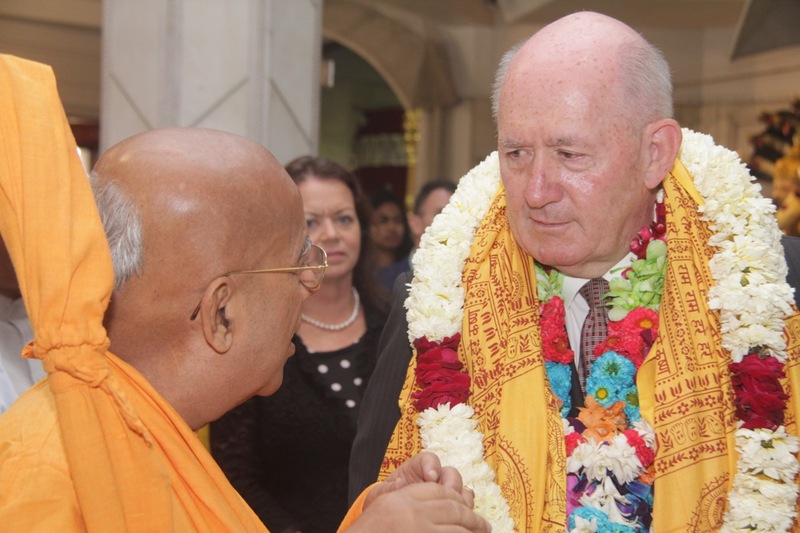 His Holiness pointed to a picture of Śrī Śrī Rādhā-Giridhari (Who is very rotund due to some excellent cooking) presiding at our Auckland farm, the General turned back to his wife with an appreciation of a Kṛṣṇa close to Home, ‘Hey these are the deities from Auckland, New Zealand.’ After the parikrama, and partaking of carināmṛita, we exited the temple, at this point his excellency wore 3 thick garlands (at least 2 kilos worth) but preferred not to take them off, but accept the offering and first of a lifetime, flower fashions, never experienced before. Drinks and rich fattening cake snacks decorated the table before us, the Governor General commented that he was on a strict diet, His Holiness Gopal Krsna replied, ‘There is a Bengali saying ‘You dress to please others and and you eat to please your stomach,’ and jested pointing to the snacks, ‘These are calorie free.’ The General replied, ‘Yeh…I have heard that before but that does not work for me’(laughter). 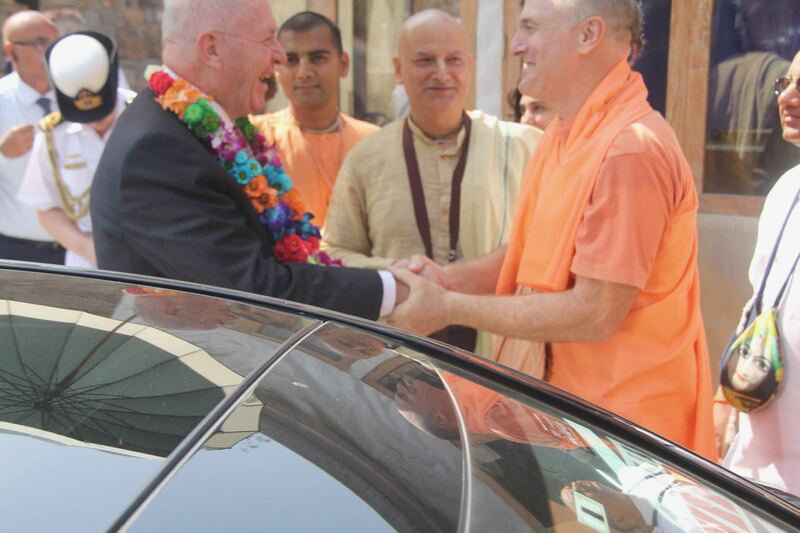 The entire party went back to the cars, the Governor general, whole heartedly thanked us for his visit. 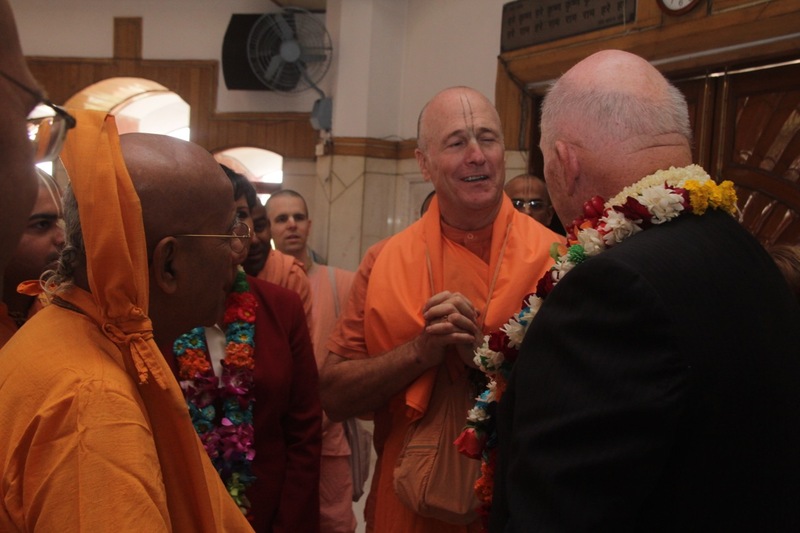 And looking at His Holiness Gopal Krsna Goswami thanked him for the kind hospitality. 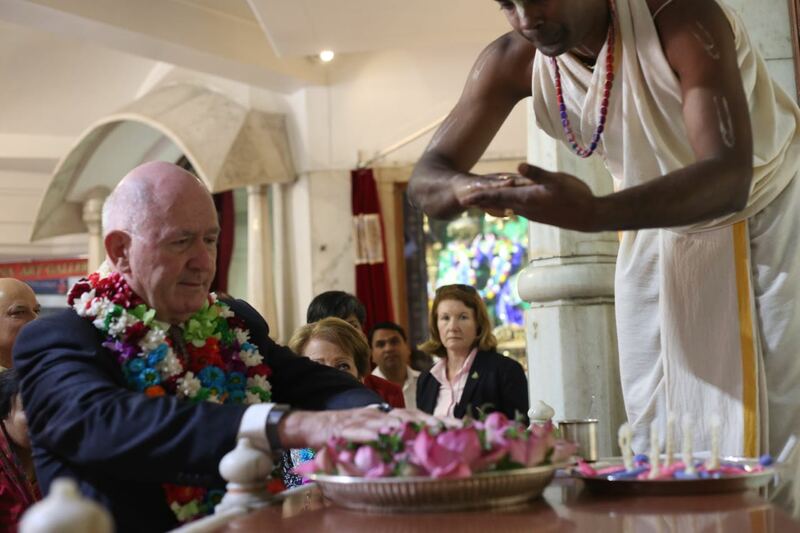 For Sir Peter Cosgrove, the visit, the most important 37 minutes of his life was over; for us, a good fortune of another day in seva; but surely Kṛṣṇa, for such a pious, kind-hearted leader, would allow him to cross paths with us again.